I won a ribbon. My first ribbon. I’m shocked. I’m thrilled. It’s going to be a good year. 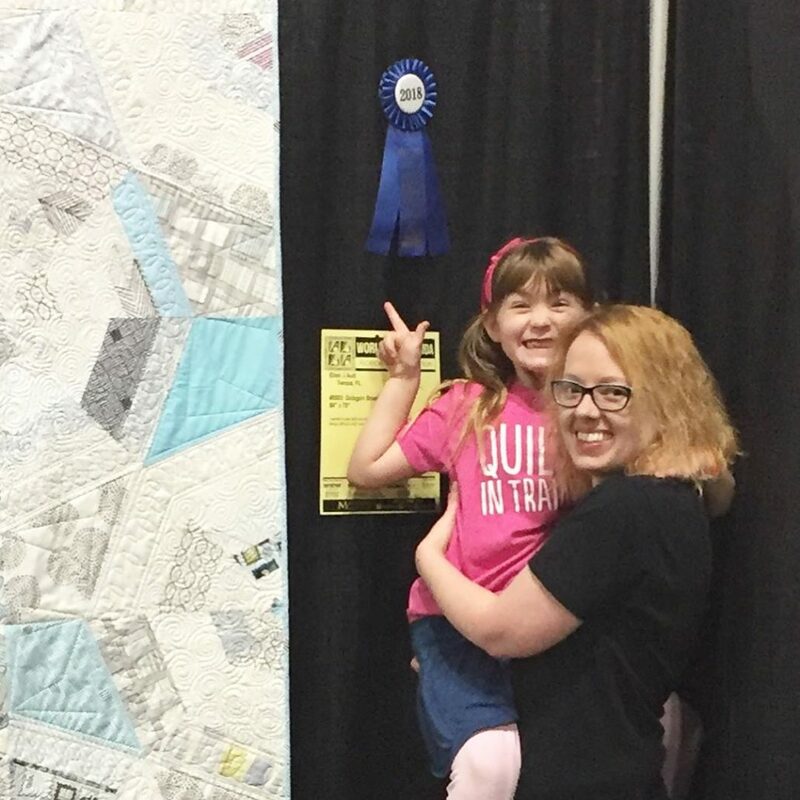 I entered two quilts into Mancuso’s World Quilt Florida competition last fall, for showing this past January 2018. If you have ever been to a Mancuso Quilt Show, you will agree the quilts are exquisite. And literally, from around the world! World Quilt Florida holds a special exhibit solely for Florida Quilters. So why not enter, right? My ‘competition’ is limited to the state. Gives me a good chance for being accepted, I thought! And well, I thought right. Both of my quilts were accepted. Octagon Shimmer on the left, Stepping Stones on the right. Both mine! That’s all I want. For my quilts to be accepted and hang. The more people that get to see my work, I know something will happen. 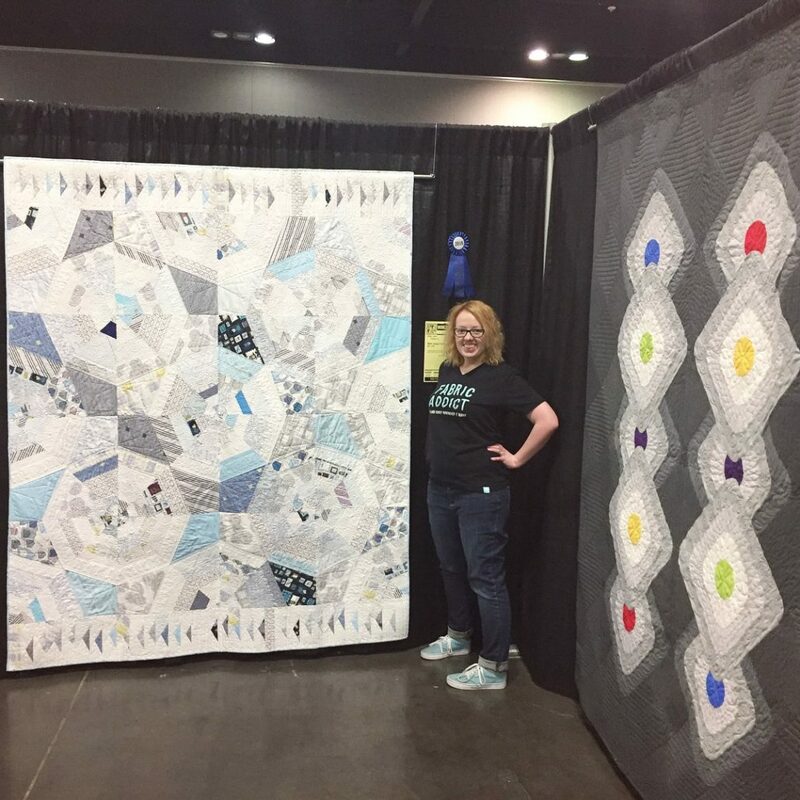 So I enter quilt shows and get lucky! This love of quilting I have can become something bigger. 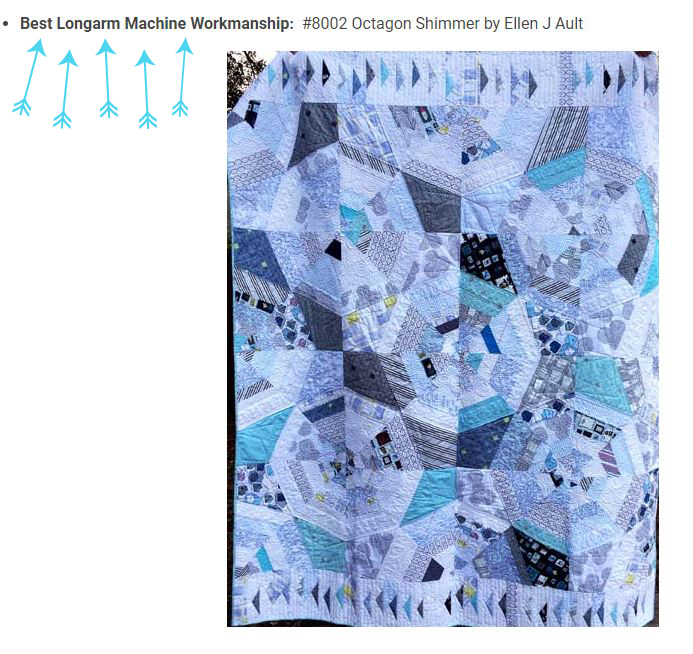 I longarm quilt for others, as a small side business. I would love for it to grow and have a continuing clientele. For people to trust my work, it would be good for them to know my work has been in shows, right? So that’s why I enter quilt shows. To be seen, solely. Win? Pfft, I’m just this little longarm quilter in Florida. I’m not Gina Perkes, I’m not Judi Madsen, nor am I Angela Walters. I’m just me. 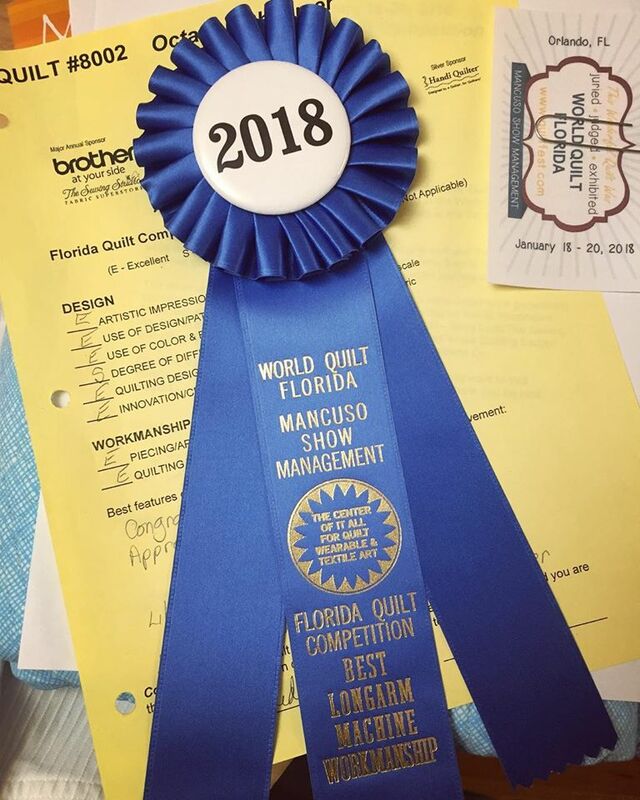 So imagine my surprise to learn that I won a ribbon for Best Longarm Machine Workmanship for the Florida Competition for World Quilt Florida! My co-workers at Happy Apple Quilts will tell you how loud I screamed, and jumped, and ran out to all of them, and made them stop working and come look at my computer. I took only a few moments to freak out. Then I sat amazed for the whole day. ME? Can I tell you a secret? I love my Octagon Shimmer quilt, truly. 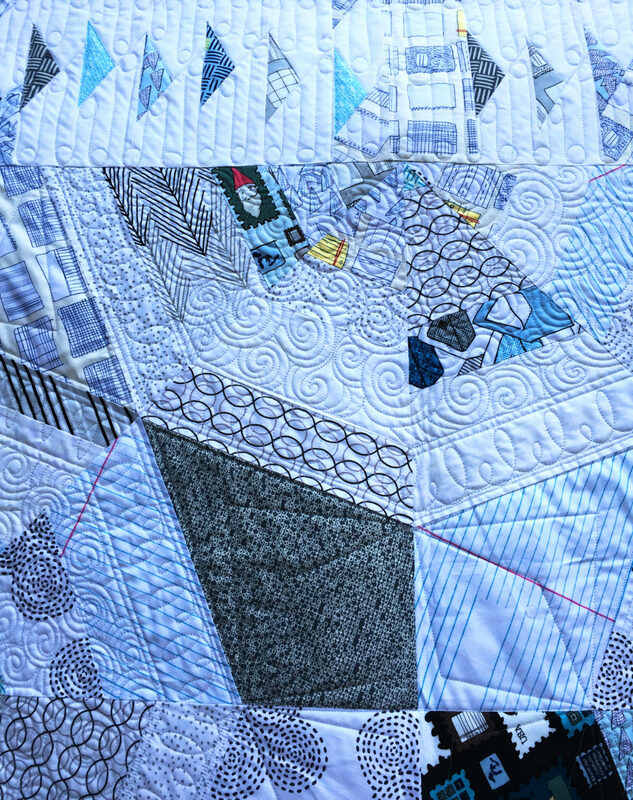 But my Stepping Stones quilt is an original design and I worked really hard on quilting it. I entered Octagon Shimmer as a second quilt, my fall back. For this reason is why I was really floored when I won. I love the quilting I did, but never thought it was ribbon worthy! Nothing will happen, if you do nothing. Hence my motto: Leap and A Quilt Will Appear. And maybe, just maybe, it will have a ribbon, too. Factual stuff: Pattern is Octagon Shimmer by Jennifer Sampou, fabric collection is mainly Heather Givan’s Paper Obsessed, with other fabrics mixed in. yay! That’s our leader!!! It is so cool and pretty!! !